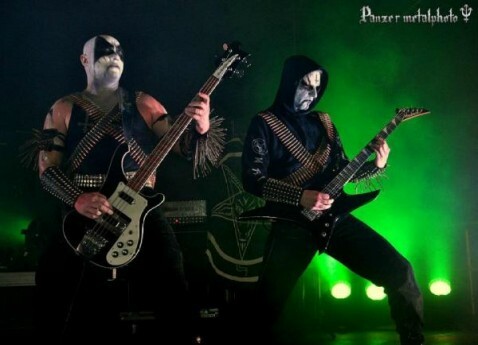 The election to parliament of a bass player from the Greek Black Metal band Naer Mataron has the Greek media scrambling to find connections between facism and heavy metal. Chaos, as Greeks like to say, is a Greek word. And Greeks might agree that the election of a Black Metal musician to a country’s legislature does not bode well for political stability. This is the band that everyone in Greece is talking about these days. It’s called Naer Mataron. It’s not often that a Black Metal band gets to bask in the glow of the mainstream media spotlight. But it’s even less common that the bassist from a Black Metal band becomes a member of parliament. Stefanos Stefanopolous from webzine Rockway.gr explains. Giorgos Germenis will represent Golden Dawn from the Greater Athens district. He’s known by the stage name “Kaiadas.” That’s the chasm in ancient Sparta where children were thrown to their deaths after being judged unfit to meet the rigors of Spartan life. Stefanopolous says Black Metal lyrics often concern Satanic and pre-Christian pagan themes and Naer Mataron is pretty much run of the mill. That’s changed now. The Greek media are looking for connections between Naer Mataron’s music, their bloody ghoulish stage attire and Golden Dawn’s politics. Germenis – Kaiadas – says there is none. Take this song, “Death Casts a Shadow Over You,” from Naer Mataron’s latest album “Praetorians”. Germenis says: “Death Casts a Shadow Over You” is a song about the feelings that the black metal fans have when they hear our band performing live on stage. Its a metaphor for the shadow they feel covering them when we play. As for politics, Germenis says there’s an easy solution for Greece’s myriad economic problems. First the country needs to resolve its sea border issues with neighboring countries. There’d be big money in gas and oil exploration which would return Greece to greatness. He blames unspecified “interests” for holding Greece back. With coalition-building in Greece now in limbo, it’s unclear what affect Germenis and Golden Dawn will have on Greek politics. But Stefanopolous says there is one definite side-effect of his accension to politics: Black Metal has gotten a black eye. Greek democracy isn’t looking so great either. Greeks are already talking about if the new parliament will form rather than when. But whether or not the electoral success of Golden Dawn will go anywhere, Naer Mataron will continue to delve into the darker world below.